As the last tiny patches of snow have been melted by an unseasonably warm few days last weekend and the famously long days are making their highly anticipated appearance, spring looks to have finally sprung in Uppsala. The sudden change in temperature and scenery has been a shock, and it’s not long before you find yourself acting like a true local. Face turned up to the sun at every opportunity, having fika outside not because it’s especially warm, but just because – for the first time – you’re not risking frostbite doing so, admiring blossom and birdsong like you’re an extra in a Disney film… If you thought Brits were known for being ridiculous at the first sign of sun, you clearly haven’t met a Swede. Joking aside though, the upturn in the weather has sparked some pretty serious conversations about the impact of such a long and difficult winter on people’s mental health. Before I came to Sweden, I had a reasonable awareness of Seasonal affective disorder, but I definitely hadn’t fully comprehended how intricately connected daylight and weather are with physical and mental well-being, especially my own. The notion of biting cold and extremely short days was only a novelty when I was organising my year abroad, and I gave little thought to the fact that my reality wouldn’t be a winter wonderland of hot chocolates and sledding for a week or two, but rather attempting to navigate the mundanities of daily life in miserable, cold, dark conditions, for what ended up being about a five-month stretch. As much of a chore that leaving the warmth and comfort of your bed may seem on particularly dreary winter days, I cannot stress enough the importance of forcing yourself out of the house and meeting up with friends. The Swedish institution that is fika is practically designed for this purpose, so embrace the local culture and consume copious amounts of coffee and cinnamon buns in good company. Uppsala has an abundance of cosy cafes, many open until 10pm, and of course the nations all offer watering holes – VG and OG both have underground bars, which you may as well make the most of when the weather’s poor, as you’ll be ridiculed for sitting indoors when the sun finally makes its appearance. Even though I’d opt for Swedish summer over winter any day, I’m really glad for having had the opportunity to experience activities which the mildness of the British climate doesn’t facilitate. Cross-country skiing on a frozen lake is one of the coolest (pun intended) things I’ve done on my exchange, and I can’t deny the beauty of the city when it’s entirely blanketed in snow. Skating, skiing and sledding are all popular Swedish activities which you rarely have the chance to try in the U.K, so make the most of it while you can! Exercise is also a fantastic antidote for low-mood, so you’re killing two birds. 3) Det finns inget dåligt väder, bara dåliga kläder! This Swedish proverb – “There is no bad weather, only bad clothing” – is something to live by on your exchange. If you’re to achieve the above points, you’ll need to be ready for all that the Swedish winter can throw at you, so pack wisely/ be prepared to invest in clothing that will last and get you through some very cold and damp months. Leggings/tights under trousers is a must, biking (or for that matter, anything) will be impossible without heavy-duty gloves and wool socks are your friend. Winter happiness = abundant layers of clothing and a hood so furry you’ll forget peripheral vision ever existed? As a student city, there’s always something happening in Uppsala, and events are often free or discounted. Pub quizzes are regularly organised by the nations and provide a great opportunity for catching up with friends, Musicum (the university music department) often hosts free concerts, and film, music and theatre festivals are a regular feature in the winter calendar. Uppsala also boasts a number of independent cinemas which are a lovely way to spend an evening when the weather’s against you -Fyrisbiografen and Slottsbiografen are my personal favourites. As a history student, I have to confess that I don’t fully understand the scientific importance of vitamin D, I only know that my mum insisted on packing me off with a year’s supply of tablets that I was told to take daily. I failed in this instruction, but would pass on the advice to others, as it gets bandied around a LOT here, so I assume it’s a rather big deal. Without many hours of daylight (around 5 hours in Stockholm in winter) and weak sun, not to mention being wrapped up from head to toe, your body’s vitamin D supplies will be seriously lacking, so supplements are the go to. To compensate for the impact of a dearth of sunlight, the university also has a free “light room” to tackle winter fatigue, and I’ve heard good things about light therapy boxes from a friend, which can be purchased online, though a good one will set you back a fair bit. Most importantly of all if you’re struggling, remember that you’re not alone, and that it’s a difficult season for most people in Scandinavian countries. Talk to your friends about how you’re feeling, and reach out to the university’s student health services if you feel in need of extra support. It can be a tough few months, but believe me, the Swedish spring tastes all the more sweeter for it. The cold weather has come to Zafra. When I say cold I mean that the temperature is no longer 30 degrees; it’s dropped to about 14, but this change occurred in the space of two days and no one was prepared. You’d think a polar vortex had hit Spain. In the streets the (woollen) gloves are out, I’ve seen multiple bobble hats and last season’s Zara scarves are making all kinds of appearances. At school the playground is deserted, the students are occupying the corridors and the teachers are despairing. You can just about hear the exclamations of ‘que frio!‘ beneath the layers of snoods and baklavas. My last post told of the brilliant and unexpected sunshine. This is definitely no longer the case. The temperatures dipped drastically about two weeks ago. Over the course of the last month the average temperature has dropped from hovering around 25 degrees in September, to a regular -5 now we have reached November. 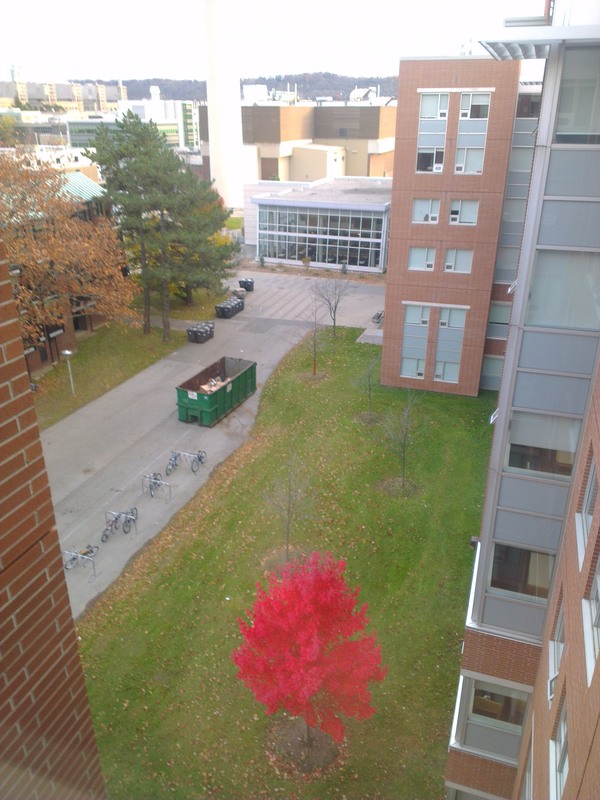 There is, however, one tree on campus that refuses to admit the change in weather. Preparing for Winter in North America! The last month has flown by so quickly I’ve hardly had time to sit down and write my blog! FIlled with assignments, more quizzes, and the dreaded Midterms, it has definitely been the hardest month since arriving here, and right up here with anything I’ve experienced at Durham. The sheer volume of work has been difficult to manage, made much harder by living in such a amazing part of the world, with uncountable distractions wherever you look – It has never been easier to procrastinate! With the continual assessment it has quickly become apparent that staying on top of your work is key – no more cruising through 2 terms preparing yourself for the mad last term like back in Durham. Of the two completely different systems however, I’m still not sure which I prefer. Maybe I will have a better idea when my results start coming back in, but it certainly takes time to adjust between the two. The system here forces you to keep constantly reviewing your work, which actually really helps to remain engaged with the content – for the first time in a long while I actually understand what is going on in lectures….to some degree anyway, which makes a refreshing change.